The compact UR22 offers 24-bit, 192kHz recording, a bundled version of Cubase, and a very reasonable price: what's not to like? Out of the box, first impressions are very favourable. The UR22 is presented in a stylish black and silver metal case that feels even sturdier than that of the UR28M I previously reviewed. Indeed, this robustness extends to the controls themselves; the potentiometers all have a solid action and a stiff, flush-mounted toggle switch is used to avoid the accidental switching of phantom power. The front panel houses the two combination mic/line inputs and monitor controls. The preamps have simple controls comprising gain and a switch for toggling input 2 between line and instrument level. LEDs are provided to indicate input overload, and there are additional indicators for phantom power and USB connection. The monitoring section has controls to set the level for the main output and the single headphone output, and a mix control takes care of the hardware monitoring, establishing the balance between input signals and playback from the computer. This potentiometer is centre-detented to make setting a 50/50 mix a trivial task. On the back panel there are two balanced quarter-inch TRS line outputs, MIDI In/Out sockets, and the aforementioned phantom-power switch. Helpfully, the physical locations of these facilities are marked on the top of the case in white, making it easy to plug things in without having to look around the back. A USB cable is provided in the box, as well as a license card for use when downloading Cubase AI. The UR22's rear panel features a USB 2 port, a switch for the phantom power, MIDI I/O sockets and a pair of audio outputs on quarter-inch jack sockets. To get the hardware up and running, you install a simple USB driver from the disc included in the box. This driver provides a control panel allowing Windows users to change buffer settings and sample rate. For Mac OS computers, these settings are available in the standard Audio MIDI Setup application. As is common to all Steinberg products, gaining access to the bundled software does require you to jump through a few hoops. First, the hardware needs to be registered online and a user account set up. The activation code on the card supplied in the box is then entered. Following this, Cubase AI 6 is available for download via a hefty installer file (almost 600MB in size). Frustratingly, the servers timed out a couple of times when I attempted to download the software, but did eventually succeed in delivering it to me. Finally, another code needs to be entered in the 'eLicenser Control Center ' application, to ensure permanent functionality (the software is otherwise limited to a 30-day evaluation period). Once you've succeeded in installing it, Cubase AI 6 supports up to 32 audio tracks and 16 instrument tracks. Also provided are 180 basic instrument sounds (principally the General MIDI set), courtesy of the included Halion Sonic SE instrument. These are useful for sketching out musical lines. 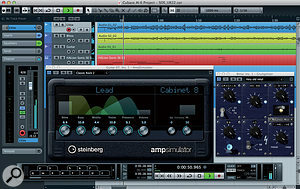 AI 6's four-band EQ section and other quirky limitations (a maximum compression ratio of 8:1, for example) could well prove restricting for some, but although the bundled reverb plug-in tends to sound quite nasty on acoustic instruments, other plug-ins, such as the amp simulator and the ubiquitous 'Grungelizer', are surprisingly useful, considering the software's entry-level status. Given that its functionality can be expanded exponentially through the addition of freeware or inexpensive third-party VST plug-ins, AI6 constitutes a useful starting point for recording projects. The main sticking point, however, is that the software only supports sample rates of up to 96kHz, so users wishing to record at higher rates will need to turn to other software. This needn't be expensive, but is worth consideration if high sample rates are crucial to your work. To address this situation, Steinberg promise UR22 purchasers a free upgrade to AI 7, which will apparently support higher sample rates, on its release. They were unable to comment on when the update might be released, but I assume that it will be fairly soon. An upgrade path to Cubase Elements is also offered for a modest fee. This offers further virtual instrument sounds, a higher track count and useful plug-in additions including pitch correction. However, the sample-rate limit is imposed here too. 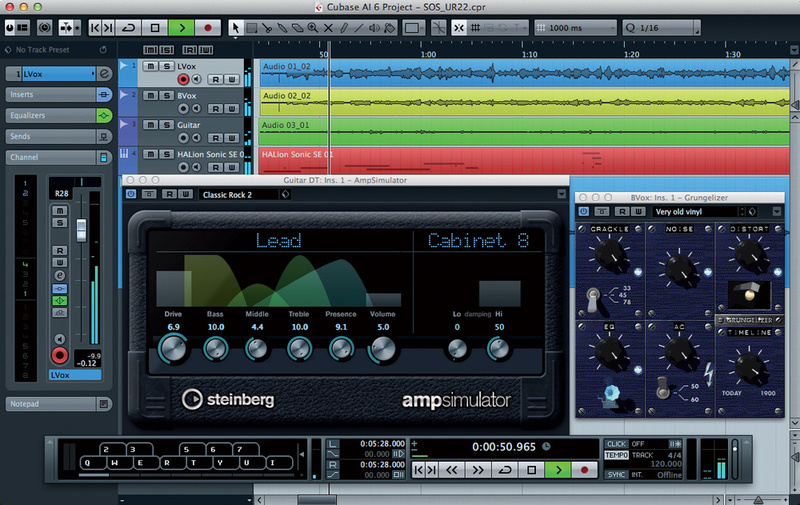 The Cubase AI arrange window with the Amp Simulator and Grungelizer plug-ins visible. I put the hardware and software through their paces by recording some acoustic instruments with a condenser microphone. The microphone inputs provide a very healthy level of gain — up to 60dB — and so don't need to be set very high to achieve a desirable level. This is perfect for dynamic and ribbon microphones requiring lots of gain. Meanwhile, very loud instruments might possibly require pad switches to be engaged if condenser mics are being used. The preamps are noticeably less noisy than other units I've used at this end of the market. They capture life-like performances with ease and a great sense of dynamic range, even at relatively modest sample rates. 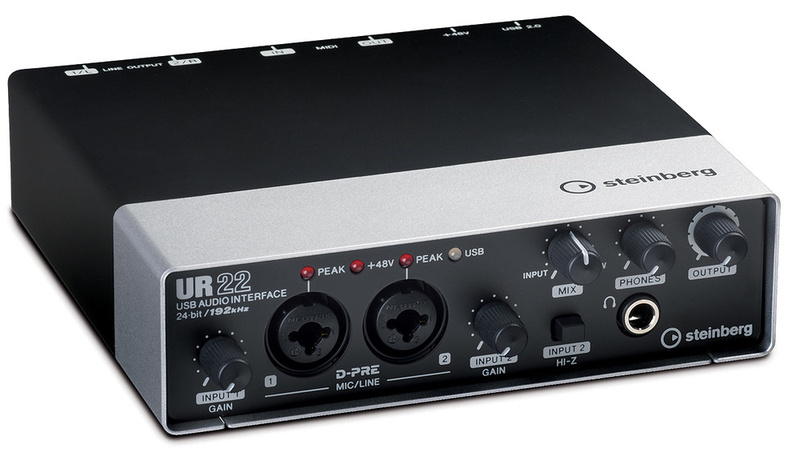 Phantom power is applied to both inputs simultaneously and, while that's not unusual for a unit at this price, individual switching would have really set the UR22 apart from its competitors. It would also have complemented the 'special' status of the preamps and would have introduced the option to use condenser and ribbon mics in combination. The UR22 is incredibly straightforward to use, especially when monitoring inputs at source, when you don't have to adjust buffer sizes and so on. The Mix control can immediately be tweaked to give the perfect balance between inputs and playback. Inputs are summed to the direct monitoring mix in dual mono, and it would have been great to have a mono/stereo switch for this. I find that hearing each input hard panned can prove useful for distinguishing between microphones when placing and recording them, especially when I'm playing an instrument and engineering concurrently! The headphone amp provides a strong output level to the cans, but is slightly noisy at the very top of its range. Indeed, the same is true for the main outputs if they're cranked to the very highest levels. One slightly frustrating quirk of Cubase AI meant that I could not disable software monitoring globally; the option was greyed out in the control panel on my system (Mac OS 10.7). This is a pain when using the hardware monitoring method described above, and has to be side-stepped by turning monitoring off on individual channels when you're preparing for recording. This is not ideal, since you lose input level metering on the channel, but thankfully the input levels still remain visible in the transport bar, and are represented in the waveform as it's drawn. The issue didn't arise with any non-Cubase software I tested. Those looking for a compact, good-quality audio interface will not be disappointed by the UR22. Its rugged construction and low noise are big plus points at this price, and the ability to record with very high sample rates at 24-bit resolution will surely appeal to anyone in the market for an interface to use for mobile stereo recording. The Tascam US144 MKII has a slightly lower street price than the UR22 and supports recording up to 24-bit/96kHz. It adds S/PDIF digital I/O to the UR22 specification, and its direct monitoring mix can be switched between stereo and dual mono. Level verification is slightly more sophisticated, too, via dual-colour signal/overload LEDs. Its line inputs and outputs are unbalanced (with the latter being RCA connections), so it may be a little more susceptible to noise. The Roland Duo-Capture Ex is slightly more expensive than the UR22 and records at resolutions of up to 24-bit/48kHz. Like the Steinberg, it has high-quality preamps, one switchable between line and instrument level. Its unique selling point is its iPad/stand-alone compatibility, achieved using a power adaptor or batteries. Direct monitoring has a simple on/off control, but can be switched between stereo and dual-mono modes. Recording quality of up to 24-bit/192kHz. Works with Windows XP SP3; Windows 7 SP1; Windows 8 (32- or 64-bit) and Mac OS 10.5.8 to 10.8 (tested using 10.7.2). Two balanced mic/line 'combi' sockets with Yamaha D-class preamps (input 2 switchable to unbalanced instrument input). Supplied with USB cable and Cubase AI 6 (via download). Individual phantom power switching would have been nice. There's no stereo option for direct monitoring path. An easy to use audio interface capable of high-quality results. If you only require two inputs and outputs and don't need digital connections, this smart little unit should be near the top of your list.